Yellowstone Park Proposes Cull Of 1,000 Bison This Winter : The Two-Way The park proposes killing mostly cows and calves in this year's annual cull. The park's bison population neared 5,000 this summer; a 15-year-old agreement with Montana calls for a population of 3,000. A bison herd with calves travels through Lamar Valley, Yellowstone National Park. The park has proposed a cull of 1,000 bison, primarily cows and calves, this winter. Bison have been culled from the park annually since 2000, as part of an agreement between Montana and the federal government to keep the bison population near 3,000. 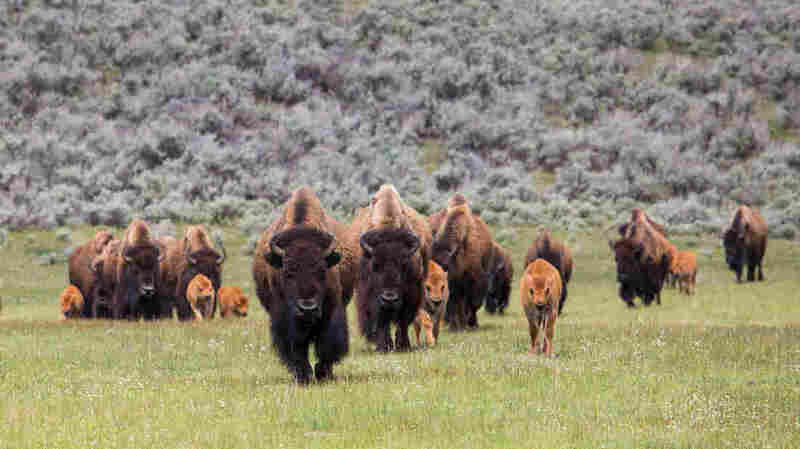 There were about 5,000 bison in Yellowstone this summer, the Associated Press reports. The agreement to cull the herd is a 15-year-old compromise. During harsh winters, Yellowstone bison sometimes migrate out of the park and into southwestern Montana. As the park's bison population grows, more animals migrate out of the park. Ranchers in Montana worry that the bison could infect their herds with brucellosis, a disease that has been virtually eliminated from Montana cattle, Reuters reports. Many bison have been exposed to brucellosis, which can cause cows to miscarry their young. Ranchers are also concerned about overgrazing, the wire service reports. This year's 1,000-head target is not yet final, and park officials still need to meet with Native American tribes and state and federal officials to finalize their plans. If approved, a cull of 1,000 animals would be the largest in eight years. Last year, park officials planned to kill up to 900 animals, and actually removed 737. The culling program has been controversial from the start. Each winter, some of the culled animals are killed by hunters, including Native American tribes who have agreements with the park; others are slaughtered for meat. The National Park Service is well aware of how the public feels about Yellowstone's beloved bison heading to slaughterhouses. An FAQ on the Park Service website explains that few facilities need bison for research, and there are restrictions on when and where bison can be hunted. "Thus, bison at times need to be removed from the population by other means, such as shipments to meat processing facilities, even though there is little political or social support for such actions," the Park Service writes. A Yellowstone spokeswoman tells the Associated Press that the cull is required by the legal agreement with Montana, not by environmental factors. "If there was more tolerance north of the park in Montana for wildlife, particularly bison ... to travel outside the park boundaries, it wouldn't be an issue," Sandy Snell-Dobert told AP.